RB Marshawn Lynch seemed good to go Sunday against Minnesota — until he informed the Seahawks Friday afternoon that he won’t be able to play in the wild card game. In a surprise move, RB Marshawn Lynch informed the Seahawks Friday after practice that he was unable to play in an NFC wild card game Sunday against the Minnesota Vikings. Lynch, who rejoined the team earlier this week for three practices after sitting out nine weeks following sports hernia surgery, did not travel to Minneapolis. Lynch was listed as a full participant in practice all three days after he rejoined the club, creating optimism that he would be able to go against the Vikings. But he was downgraded to questionable on the afternoon injury report. Sometime between Carroll’s after-practice comment and the team’s buses to Sea-Tac, Lynch determined that he wasn’t ready. A news photographer covering the departure from team headquarters in Renton tweeted Lynch’s absence. 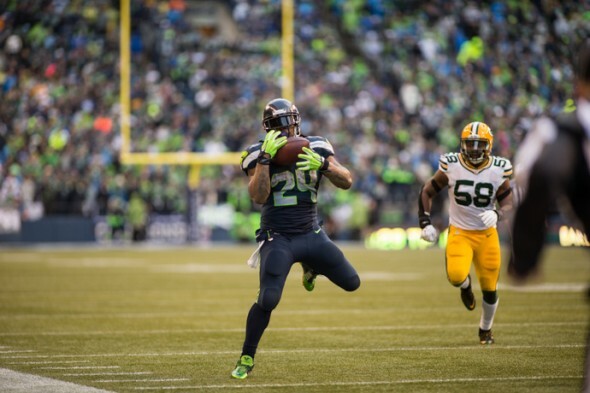 So the Seahawks will move ahead with running backs Christine Michael and Bryce Brown. Michael has carried 39 times for 192 yards since rejoining the Seahawks late in the season. Brown has carried 25 times for 72 yards. Lynch played in seven games earlier, occasionally being spelled by rookie Thomas Rawls, before opting for sports hernia surgery. He carried 111 times for 417 yards. Rawls then went down for the season with an injury, prompting the Seahawks to re-sign Michael, whom they traded to Dallas in September. The Seahawks defeated Minnesota 38-7 Dec. 6 and are a five-point pick over the Vikings Sunday. The game kicks off at 10 a.m., PT. Remarkable that he didn’t travel to the game just in case. If for no other reason than to be on the sideline for his mates. With that injury, I’m not surprised. He’s not a spring chicken any more. As for not traveling with the team: Marshawn does what Marshawn wants, mostly. The Seahawks feel he’s earned the right. Given his output, it’s hard to argue with. Don’t agree – unless the doc’s told him to stay, no excuse to not be at the game. Why would doctors tell him not to fly and dress with a hernia injury after two months of very professional treatment? The cold? 6 weeks..but what players do you know go to away games when injured and out? I see them at home games. Just think how much the press would be hounding him if he did. .
Willson is not traveling either. Does he do what he wants also? It seems it is protocol for players not to travel with the team when hurt. If it was a home game you might sound like you know something. Never claimed to know anything, including the travel (nontravel?) protocol. Just speculation, which appears to be incorrect. Oh well. he only practiced so he wouldn’t get fined. Could it possibly be since he informed the team he wouldn’t be able to play, both sides decided to keep him back? Maybe the Hawks would like to avoid the speculation circus of his availability and the other sideshow nonsense & focus on winning the game. All the national idiots falsely continue to claim their success depends mostly on Lynch which has obviously not been the case this year. They don’t need the Lynch distractions this week.